Choplifter! is a computer game developed by Dan Gorlin, and first published by Brøderbund Software in 1982 for the Apple II computer. Games related to Choplifter! were Lode Runner and Raid on Bungeling Bay, all three games featuring the fictional Bungeling Empire. In 1985, Sega released a coin-operated arcade version of the game (removing the exclamation point in the title). 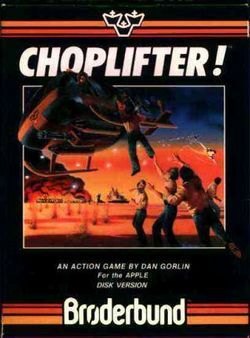 While many arcade games have been ported to home computers and consumer consoles, Choplifter! was one of the few games (Lode Runner is another) to take the reverse route: first appearing on a home system and being ported to the arcade. In Choplifter, the player assumes the role of the pilot of a helicopter capable of performing an array of dazzling aerial stunts. You must take off from your home base (a post office, of all things) and fly across a horizontally-scrolling playfield of rugged terrain to reach the enemy Bungelings' barracks. There, you must land and rescue a group of helpless hostages and return then to your base. To hinder your mission, the enemy will attack with an array of armaments including tanks, jets, and dangerous air mines. To complete a perfect game, you must rescue all of the 64 hostages. Ports of the original Apple II game appeared on several early Atari and Commodore systems, the ColecoVision, and MSX. A TI-99/4A port was announced, but never published. German publisher Ariolasoft published the European Commodore 64 version. In 1986, ports of the arcade version back to home versions were developed for the NES and Sega Master System. Not surprisingly, the arcade version and its ports are more colorful and intense than the Apple II version. It boasts more environments (desert, sea, caves and city) as opposed to the Apple's single desert environment. Choplifter was fairly successful and popular, spawning two sequels: Choplifter II for the Game Boy and Choplifter III for the Game Boy, Sega Game Gear and Super NES. This page was last edited on 4 December 2008, at 08:05.